One has to wonder how Neil Gaiman's books can be classified in the children's category. There's always something macabre - a threatening dark shadow - that lurks on the edges of every page. Yet it's also so very compelling and imaginative that, like Roald Dahl, it would be a pity for his books to be confined for kids' enjoyment alone. The Graveyard Book begins with a murder - in fact three murders, which should have been four. 'The man Jack' has stealthily entered the house of a sleeping family and murdered the parents and a child, but the baby of the family, a lone boy, has toddled off and disappeared, making the murder incomplete. Somehow he enters the one place that Jack can't find him - the local graveyard - where he is sheltered and raised by its ghostly inhabitants. Adopted by a ghost couple, he is called Nobody Owens (Bod for short). Creepy? You betcha. But does it work? Boy does it. The ghosts are depicted as normal people whose time in the real world had ended, but their lives have not. There are nice ghosts and nasty ones, friendly ones and stuck up ones and boring ones. And of course, there's Silas. Bod's guardian - a shadow who moves between the real world and the ghostly one - who oversees his education and protects him from the malevolent evil that murdered his family and is now out to find him too. Only in the graveyard can Bod remain safe. 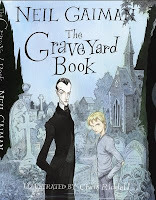 The Graveyard Book is a truly imaginative tale of a young boy who grows up learning his boundaries, making mistakes, mastering his lessons and is ultimately set loose to discover the world. The wonderful in-between-death-and-life world that Gaiman conjures up is an interesting (and rather creepy) parallel to the real world and the hurdles children face as they grow up. Its slightly dark nature is actually quite realistic, as I don't remember my childhood being all fairy floss and fun, as many other kids' books would have you believe. Neither did I grow up in a graveyard, but Neil Gaiman's masterful storytelling makes The Graveyard Book a very enjoyable read.